In early October 1896, 23 year old Zona Heaster met Trout Shue and instantly fell in love with the powerful 35 year old blacksmith. Though her mother vehemently objected, within weeks the two were married. Three months later Zona was dead. Her death was ruled to as accidental but rumors of murder persisted. 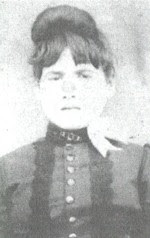 As far as her mother, Mary Jane Heaster, was concerned the rumors were verified when Zona’s ghost appeared to her four nights in a row and told her of Trout’s cruelty. Mrs. Heaster's persistent telling of this story prompted authorities to exhume Zona’s body, and find that her neck had been broken. Trout Shue had been accused by the Greenbrier Ghost. The tale of Zona Shue’s murder is a ghost story, handed down generation to generation in the oral tradition. Facts in the case are sparse; stories vary from teller to teller and often contradict each other. When supernatural elements are added to the mix they tend to push out the truth. This synopsis will be limited to verifiable facts. Elva Zona Heaster, was born in Greenbrier County, West Virginia in 1873. She is often portrayed as pure and innocent, but in November 1895, at age 22, Zona had a child out of wedlock. On a visit to the blacksmiths shop with her family the following October, she met and became infatuated with the handsome blacksmith, Trout Shue. She returned soon after and let him know she was interested. Zona and Trout had a whirlwind courtship and were married on October 20. Erasmus Stribbling Trout Shue was born in 1861 or 1862 in Augusta County, Virginia and grew up in Droop Mountain, West Virginia. He was as at least eleven years older than Zona. His first name was later changed to Edward, but in Greenbrier County he was known as Trout. Zona was not his first wife; Trout had been married twice before. In 1885 he married Ellen Cutlip and in 1887 they had a daughter, Girta Lucretia Shue. 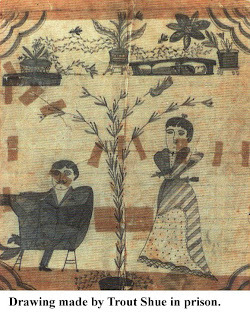 In 1888 they were separated and in 1889 divorced; Girta was raised by Ellen’s parents. In 1894 Trout married Lucy Tritt and less than a year later Lucy was dead. There is no record as to how Lucy died, stories of her death range from falling on the ice while pregnant, to being hit on the head by a brick accidently dropped by Trout, to being deliberately poisoned by Trout. Trout Shue’s life seemed to be nothing but turmoil. Between his first two marriages he was arrested for stealing a horse and spent two years in prison. After his second wife died he moved to Greenbrier County to start a new life. He found work as a blacksmith, a lucrative trade he had learned from his father. His marriage to Zona was another step toward a better life. On January 23, 1897, just three months after the wedding, the body of Zona Heaster Shue was found at the foot of a staircase, by a neighbor boy hired by the Shues to do chores. The boy told his mother what he had seen and she sent for the doctor. Dr. George W. Knapp arrived to find that Trout had taken his wife to the bedroom and dressed her for burial. She was lying on the bed wearing a high-necked dress. Dr. Knapp began to examine the body, but it so distressed Trout that his examination was incomplete. He first reported the cause of death as “an everlasting faint” but later changed the cause to “childbirth.” If Zona was pregnant at the time of her death she had told no one. Zona’s mother, Mary Jane Heaster, had never approved of the marriage and after the body was found she was convinced that Trout had murdered her daughter. She began to pray that Zona would come and tell her how she died. Then strange things began to happen. She washed a white sheet that had been in the coffin and the wash water turned red. The sheet turned a pink color that she could not remove. About four weeks after her daughter’s death Mary Jane began having visions. Four nights in a row, Zona’s ghost came to her and told her that Trout had abused her. The ghost told Mary Jane how she and Trout had argued the day of her death. She said thatTrout attacked her and broke her neck. As the ghost was leaving, she turned her head around until it was completely facing backward. Mary Jane took her story to the prosecutor, John Alfred Preston. Although he would not reopen the case for a ghost story, Mrs. Heaster was persistent enough that be began asking questions of others in town. Dr. Knapp admitted that his examination had been incomplete but he had seen bruises on her neck. 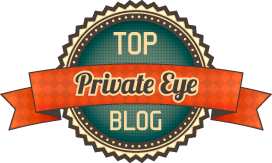 Neighbors told Preston about Trout’s strange behavior at the wake. He never left the side of the coffin and never let anyone look to closely at the body. He had wedged her head in the coffin between a pillow and the sheet to keep it straight. Some said they had seen her neck flopping loosely before it was in the coffin. The body was exhumed for reexamination. During a complete autopsy, doctors found that Zona's neck had been broken. It had been dislocated between the first and second vertebrae. Her windpipe was crushed and her neck was bruised as if she had been strangled. Following the autopsy, Trout Shue was arrested for the murder of his wife Zona. 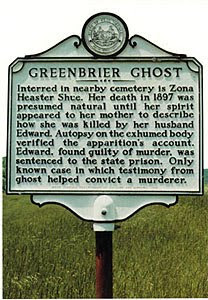 The roadside marker for the “Greenbrier Ghost” on Route 60 in West Virginia calls it “[The] only known case in which the testimony from a ghost helped convict a murderer.” This is an exaggeration. 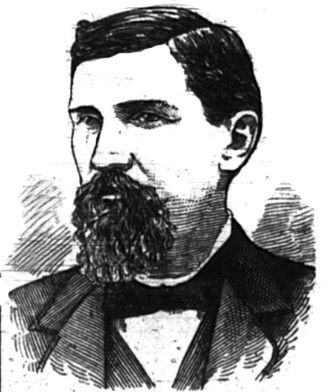 John Preston, the attorney prosecuting Trout Shue for murder, knew full well that Mary Jane Heaster’s ghost story would not be admissible in a criminal trial, so made no mention of it. But Trout Shue’s attorney, William Rucker did bring it out when he cross-examined Mrs. Heaster. His intention was to make her appear unstable and to discredit her testimony. This did not have the desired effect on the jury, and the ghost story was not mentioned again in court. Trout Shue’s trial lasted eight days. Though entirely circumstantial, the evidence against Shue was compelling. On the sixth day of the trial Shue took the stand in his own defense. He rambled on all afternoon but added little beyond the flat denial of all that had been said against him. The Greenbrier Independent reported “His testimony, manner, and so forth, made an unfavorable impression on the spectators." The jury deliberated for an hour and ten minutes before returning a verdict of guilty. Shue's sentence would also be determined by the jury. Although ten of the twelve jurors voted for execution, the decision was not unanimous so Trout Shue was sentenced to life in prison. The life sentence did not please the residents of Greenbrier County who felt Trout Shue should hang for his crime. On July 11, 1897 an armed mob gathered, intent on lynching Shue. Sheriff Nickell got wind of the plot and managed to hide Shue in the woods before the mob reached the jail. He then confronted the mob and persuaded them to lay down their arms and go home. Four of them were later indicted for attempted lynching. On July 13, 1897, Trout Shue was sent to the state penitentiary in Moundsville, West Virginia. He died there on March 13, 1900 of natural causes. Lyle, Katie Letcher. Man Who Wanted Seven Wives: The Greenbrier Ghost and the Famous Murder Mystery of 1897 . Charleston, W. Va: Quarrier, 1999. I enjoyed this story, it was well written and very interesting. I know the place that were in this story.